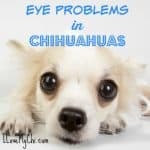 Have you noticed your Chihuahua limping or holding one of their legs up when they walk? They could have a condition known as Patella Luxation. In laymen terms it is a floating kneecap. It can progressively get worse as time goes by so it is something your veterinarian should check out. The patella, or kneecap, is a small bone, which normally sits in the tendon of the extensor muscles (the quadriceps muscles) of the thigh. The patella normally lies in a groove within the thighbone in the knee. Patellar luxation or dislocation is a condition where the kneecap rides outside the femoral groove. It is one of the most common knee joint abnormalities in dogs. 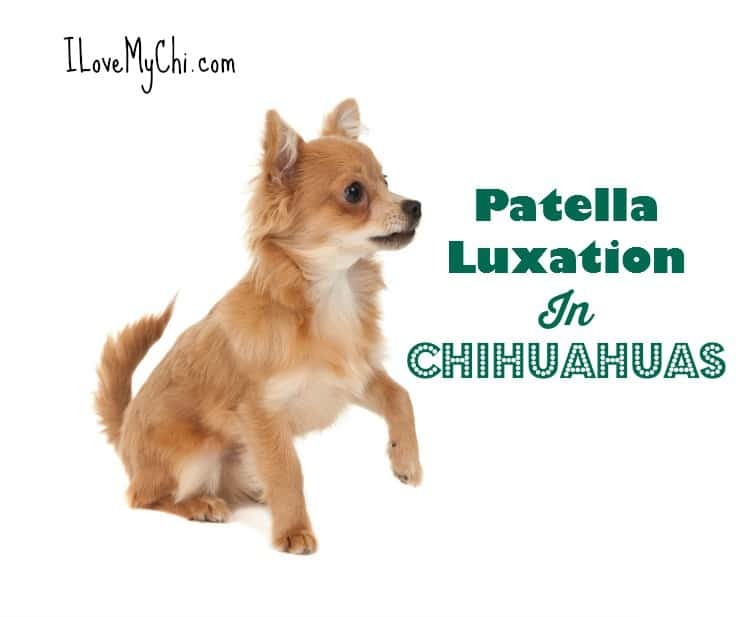 Patellar luxation is most common in Chihuahuas, as well as, in other toy and miniature dog breeds such as Yorkshire Terriers, Pomeranians, Pekingese and Boston Terriers. Patellar luxation can occur after a traumatic injury to the knee or as a result of a genetic malformation of the stifle joint. Traumatic luxation is the result of disruption of soft tissues and forceful dislocation of the patella. 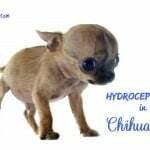 Your Chihuahua will have a very difficult time walking on the leg as the condition is very painful. If corrected early, your dog could have a good prognosis. Congenital or developmental patellar luxation can be associated with varying degrees of deformities of the hip and stifle joint, as well as the tight and leg bones. There are different grades of severity for this condition. It goes from Grade 1 to Grade 4. In grade 1, you may not even notice your dog has a problem. The higher the grade number, the more severe the condition is. You can do things to help your dog be more comfortable such as having stairs and ramps available for them. Vitamin and mineral supplements along with joint supplements can sometimes help too. Although some dogs can live their entire lives with this condition and never have it progress, many of the cases will eventually need surgical treatment, which may consist of fastening the kneecap on the outside of the bone to prevent it from sliding towards the inside or deepening the groove of the thighbone so that it can better hold the kneecap. 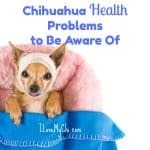 Chihuahuas who also have degenerative arthritis may also need medical treatment, which may include analgesics and chondroprotectants such as chondroitin sulfate. After surgery your dog will need frequent low-impact exercises such walking. Kneecap dislocation is genetically inherited; therefore, the breeding of affected dogs is highly discouraged. 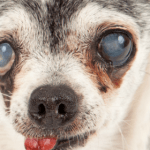 Has your Chihuahua been diagnosed with Patella Luxation? Or do you suspect they may have it? Leave a comment and let me know your experience with this condition. Yes he could have it, or he could just be hurting his legs from the jump. I think I would block off the stairs with baby gates and just carry him downstairs to keep him from doing this. The stairs are in the garden so I have no way of blocking them off ? They could be in the first stages Jackie but as long as they are in pain, I wouldn’t worry about it. If it gets worse or they seem like they are hurting, definitely get them checked out. Since our last chat his knee locked he’s A little sore will this now be an on going thing.vet said that op is out of the question because of his size . Poor baby! There’s nothing else they can do for him? My chi just had to have surgery on both knees because of this. He was a stage 4 and isn’t even 4 years old yet! He’s very active, so we are hoping this will greatly improve his quality of life. So far, so good! May I ask the cost of such surgery? Mine is stage 4 of 4 with his and is 12 years old. It really depends on the area you live in and your vet, but it can range from around a thousand dollars to 3 thousand. Check and see if you have a veterinary college within driving distance from you as you can often get it through them much cheaper. Some areas have low cost vet services too that you might want to check for. I know we have one several hours away from me in Richmond VA that does surgeries for much less than regular vets. Also check and see if your local SPCA has a vet clinic attached. They are cheaper than regular vets too. I have three Chihuahuas and lost one. Three out of my four have/had this. Two out of the three would hold their leg up and looked like they are skipping. My third one (my youngest) seems to be a little worse off. She just had to be on a anti inflammatory for eight days. She’s doing much better but only time will tell if she’ll be in pain again. Surgery is a possibility but quite frankly scares me. We’re praying she’ll be okay and just irritated it. Oh wow, that’s too bad. Were they all from the same family? This condition is common in chis but not that common. Poor babies. my four year old has it in one leg the vet says she’s to small to have surgery and will get arthritis in it if she operates or don’t . Poor little girl. Hope she feels better. That’s fantastic Dawn! Your fur baby is lucky to have you for her momma! Sounds like you have done a lot to help her get healthy. I didn’t know Glucosamine worked better in dogs. I know I tried it for me and it didn’t do much for me. One of my dogs is getting worse with arthritis and could use the help. Can I just ask, did u have to carry on this forever or just a limited time? I have a 10 mo. Chi that will occasionally skip one step when trotting. Once or twice almost each day. I’ve been showing her and she moves beautifully and uses her rear better than most. Her patelas palpate normal by my vet and she never shows pain, but I’m worried about her passing OFA when she’s 12 mo. Is Grade 1 a normal rating? It’s not as good as a 0 but it’s not bad. Just something to keep an eye out for as she gets older. My boy is 4.5 yrs old. He’s a Chi/Yorkshire mix and has a bad back leg. He’s on glucosamine but not seeming to help. We don’t over feed him, the vet says his weight is fine but could be arthiritis. Now lately he holds up his front leg to his chest and doesn’t want to move. He’s limping more every day it seems. Do you think he needs surgery? He’s not the same guy he used to be and it’s killing me! Poor little guy! He may very well need surgery. I’d tell your vet that he’s getting worse and see what he/she says. My girl has had this for 3 years. She is very physical, and keeping her from jumping is hard! This is her third bout with Carprofen 25 mg caps . She gets 1/2 in AM and PM. It seems to make her not hurt, but she still wants her walks. She is 9. Yeah it’s so hard to keep them still when they are active like that. They just don’t understand.